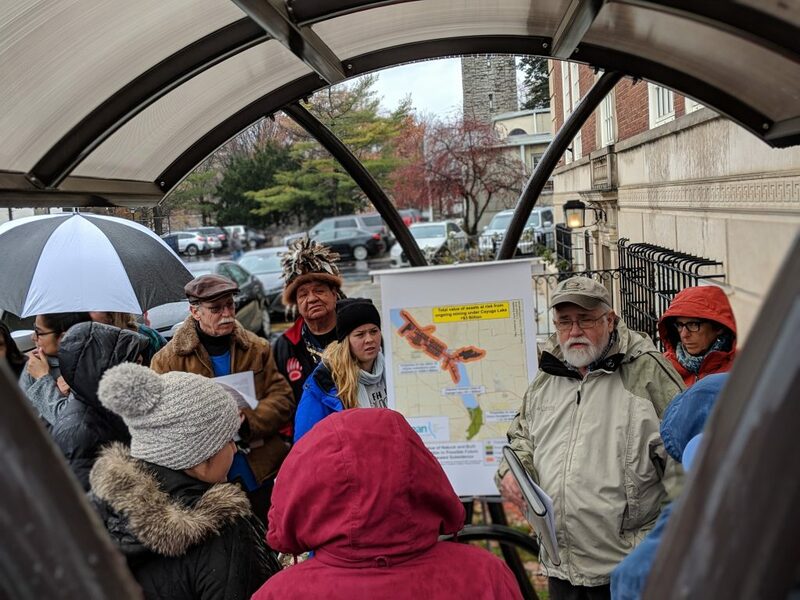 On Monday, November 26, 2018, nearly 30 residents from throughout the Finger Lakes braved the cold rain to rally for Cayuga Lake. They joined a pre-hearing rally at the Tompkins County Courthouse led by Cayuga Lake Environmental Action Now (CLEAN) to support its Article 78 litigation against the New York State Department of Environmental Conservation (NYSDEC) for not requiring an Environmental Impact Statement for Cargill’s proposed mine shaft. Sachem (Chief), Sam George, from Bear Clan of the Cayuga Nation gave a welcome to the crowd. 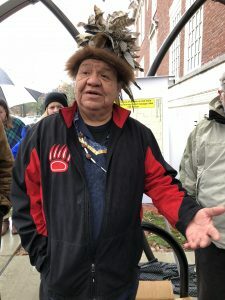 His welcome was “words before all else”, in the language of the Cayuga Nation, a reminder to give thanks for all things, from the mother earth to the skies and everything in between. John Dennis, President of CLEAN, described risks to groundwater resources posed by the proposed drilling of Shaft No. 4 and the risks associated with ongoing mining beneath thinning bedrock under the lake and south of the Cayuga Power Plant. He said that subsidence risks could extend to downtown Ithaca if the mine were to flood catastrophically, as did the Retsof Salt Mine in Livingston County in 1994. Enfield resident and CLEAN legal team member, Serenna McCloud, discussed that CLEAN is challenging the DEC’s conclusion that no Environmental Impact Statement (EIS) was necessary. CLEAN argues there certainly is the potential (which is all the regulation requires) for significant environmental impacts from the installation of the shaft that will allow continued mining under thinning bedrock between the bottom of the Lake and the mine itself. Therefore, the DEC should have issued a declaration of positive significance and required the preparation of an EIS. Tompkins County Environmental Management Council Chair, Brian Eden, began by comparing the long history of the Cayuga Salt Mine with the other major salt mine in NYS, Hampton Corners. The Retsof mine catastrophically failed, flooding that mine in 1994. A new mine at Hampton Corners began operations in 2000 and has been required to do two EIS’s in 18 years, whereas Cargill has been operating Cayuga Salt Mine for 48 years without ever having completed an EIS. An EIS would allow, for the first time, transparency, meaningful community participation and the input of third-party experts in a comprehensive environmental review of Cargill’s operations beneath Cayuga Lake. 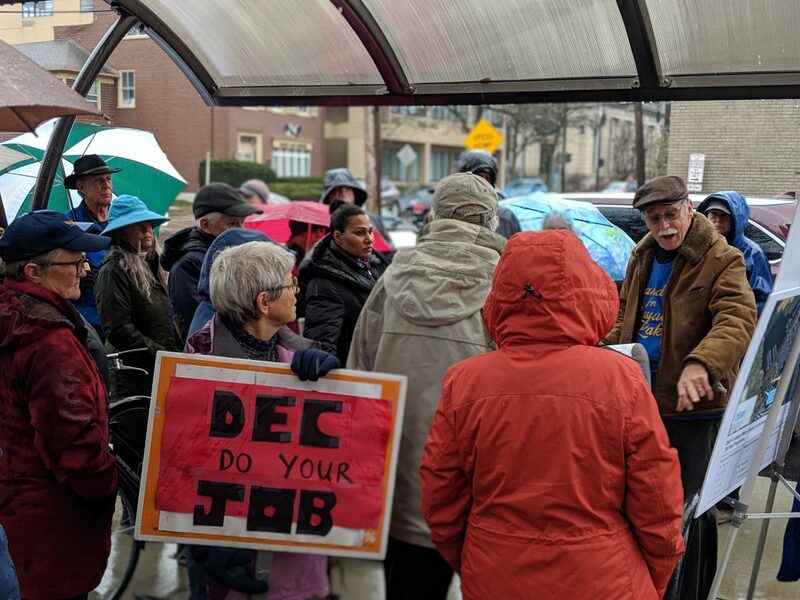 Following the rally, nearly 60 observers sat in Judge John Rowley’s Courtroom to hear the arguments on both sides of the case. The two-hour arguments elaborated on the documents previously filed with the court. Environmental Law specialist, Richard Lippes represented the petitioners, which include four municipalities surrounding the lake, nine individual petitioners and CLEAN. Lippes’ primary argument was that the DEC is required to look at the cumulative effects that the shaft would have on continued mining under the lake, and since the DEC didn’t do this, they did not comply with State Environmental Quality Review (SEQR) law. He also reiterated, that under SEQR an EIS must be completed when there MAY BE a significant environmental impact — there need only be a significant potential under the law — to trigger the statutory requirement for an EIS. Lippes also mentioned the numerous technical arguments made by petitioners during the DEC comment periods with the potential for significant risks that were not addressed or adequately addressed by the DEC. He mentioned: improper modeling of groundwater flow; not addressing the potential for a fracture network which could cause water leakage to be higher than Cargill anticipated; incorrect reading of drilling logs which shows a possible fault within the core hole; storing leakage waters near anomalies. CLEAN maintains that each one of these potential risks should have been enough to trigger an EIS under SEQR. Loretta Simon from the NYS Attorney General’s Office represented the NYSDEC and Cargill’s attorney, Kevin Roe, from Barclay Damon argued that their clients had met their legal responsibilities. Judge Rowley reserved his decision until a later date, usually expected within 60 days of the hearing. Cayuga Lake Environmental Action Now.